Lead musket ball of post-medieval date (c. 1600 - 1800 AD). The musket ball is broadly globular in form, although there are two circular flat areas that give it a triangular section when viewed from the side. The object has a white patina. It is 14.56mm in diameter and weighs 13.87g. A Post Medieval lead alloy musket ball, dating from c. AD 1600 to AD 1800. The surface patina is smooth and is white in colour. 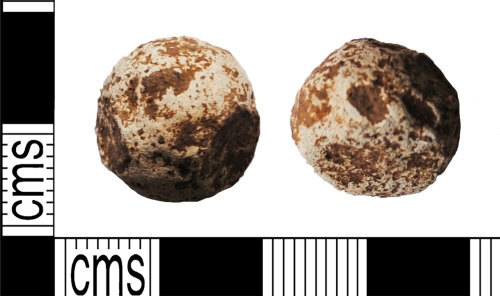 A Post Medieval lead alloy musket ball, dating from c. AD 1600 to AD 1800. The surface patina is very smooth and is white in colour.